Three-fifths of American families with teenagers who are licensed to drive have cut back on car-related expenses for their offspring because of the slumping economy, but many parents are still willing to foot the bill for their teens to be behind the wheel, according to a new Allstate Insurance survey. The survey, released Wednesday, found that 60 percent of parents with licensed teens say they are spending or setting aside less for their children’s driving. That proportion varied according to income, however, with 72 percent of households earning less than $30,000 a year tightening their belts as compared to only 32 percent of families making more than $75,000 annually. The phone survey of 600 parents nationwide reflects economic concerns among Americans. According to a USA Today/Gallup poll released this week, 80 percent of respondents said they believe the country is still in a recession and 61 percent said they expect economic conditions to be the same or worse in a year. Results from the Allstate poll appear to show that, while most parents think teens should pay some of the costs of buying and maintaining a vehicle, families with teens who have licenses are more willing to spend. 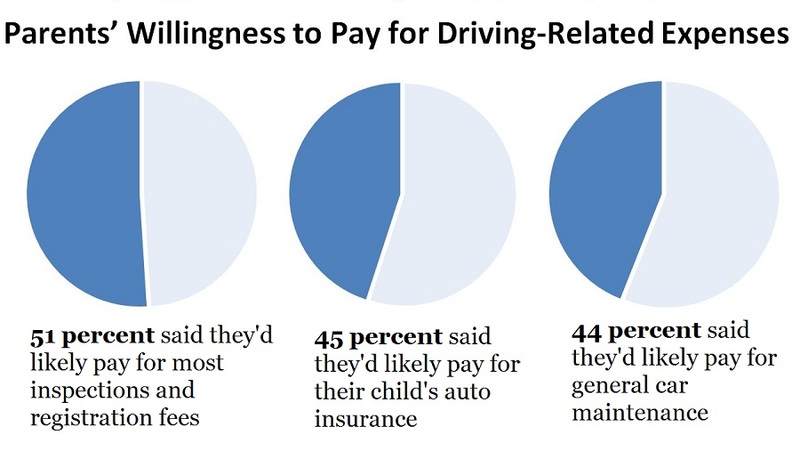 Forty-six percent of the latter group said they are willing to fully fund a car for their child, as opposed to 27 percent of all parents. A mere 10 percent of parents with kids under 14 or who were not licensed said they plan to buy a car for their children. Parents tended to draw less of a hard line when it came to shelling out for gas, car servicing and other fees. Fifty-one percent said they would pay at least most inspection and registration fees, while 45 percent said they would cover insurance premiums and 44 percent would finance general maintenance. Only 17 percent were up for paying for gas or expenses for damage caused by their child. Vehicle ownership was far more common among teens in families surveyed than it was when their parents were teens, according to the survey, with 73 percent of parents responding that their children have their own cars. By contrast, just 48 percent of parents said they had their own ride or shared with siblings when they were teens. –57 percent of all parents said they would spend $5,000 or less on a car for their child, while $41 percent said they would spend more than that. –Of families with teens who have cars, 94 percent said their child drives a used vehicle with a mean age of 9.3 years. –76 percent of parents said safety is their top priority in considering a car for their children, followed by 18 percent who considered reliability most important, five percent who favored affordability and 1 percent looking for fuel efficiency. Studies have shown that teenage drivers are far more likely to get into a crash than other motorists. That propensity results in deaths, injuries and billions of dollars in property damage each year and can has made cheap car insurance quotes for 16 year olds and other young drivers hard to come by. Allstate’s survey was conducted by phone earlier this month. It has a margin of error of plus or minus 4 percent, according to the company. To find out how policyholders rank Allstate on claims, rates and service, or to submit a review, readers can check out Allstate auto insurance reviews online.